Cephas of Iconium is numbered among the Seventy Disciples, and was bishop of Iconium or Colophon, Pamphylia. The name "Cephas" is Aramaic for "Peter." The Church remembers St. Cephas on March 30 with Apostles Sosthenes, Apollos, Caesar, and Epaphroditus; and on December 8 with the same apostles and Onesiphorus. 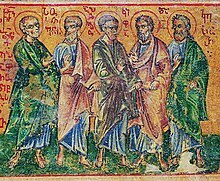 Apostles of the 70 were hand-picked (chosen) and sent by Jesus Christ himself to preach. They were chosen some time after the selection of the Twelve Apostles. All seventy are commemorated by the Church on January 4. This article is derived in whole or in part from Cephas of Iconium at OrthodoxWiki, which is dually licensed under CC-By-SA and GFDL. All relevant terms must be followed. This page was last edited on 31 March 2018, at 17:26 (UTC).